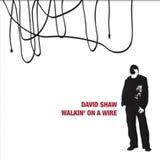 David Shaw's Walkin' On A Wire is the latest in a string of impressive, yet relatively little known hard rock albums that I've received in recent week. Steve Cone and Torok are two others that have got my attention in a very positive way. Fans of no frills, power chord rock will especially be interested in this album. David had been cranking away in the NYC hard rock scene for a number of years before moving to LA for several years. He performed local bands such as Shotgun Annie, Soul Crunch, and Down With the Blonde, which was a two time finalist in the Long Island Music Festival. Walkin' On A Wire was finished in Arizona, and David promptly moved back to NYC afterwards. From my experience as a reviewer, I can say that a great number of promo sheets oversell a band, or stretch a bit too far in comparing their sound to greats of the genre. Shaw cites AC/DC, Dirty Looks, Cheap Trick, and Enuff Z'Nuff as influences behind this album. Substitute Kiss for Enuff Z.Nuff, and I think that would sum it up pretty well. Walkin' On A Wire doesn't try to reinvent the wheel or surprise the listener, but it just delivers good old fashioned rock 'n roll with big guitars, energetic choruses, and melodic and smooth vocals. The opening track, From Now energetically sets up the rest of the album with a chord driven AC/DC style rocker. Having said that, it is important to note that the album isn't based upon the same two or three power chords repeated over and over. Songs like Make It Through the Day, I Don't Mind, Welcome Home, and Risk Another Fall delve full force into power rock pop territory of early to mid 1980's era Kiss. David's voice also sounds strikingly similar to Paul Stanley, so I think the Kiss comparisons are inevitable. Each of the songs features some thick and energetic guitar work, courtesy of Steve Cone. Steve is a busy man in the hard rock world, having just released an album of his own, Distortion. Steve's guitar work on this album is really a throwback to the fun and overindulgence of the 1980's hard rock scene. A steady barrage of catchy and crunchy riffs, scorching shreds, and very flamboyant guitar solos dominate the disc. Still they are done sensibly, with the integrity of the song never compromised by excessive noodling. This guy is truly an excellent hard rock guitarist, as he displayed on his own aforementioned album. Harmony vocals are use throughout the album to emphasize the melodies, but certainly not in an over the top manner. Some songs do stand out above others because of more inviting melodies, but there are no fillers to be found. The only track I am not sold on is What She Has Inside. The vocals sound a bit pitchy to me in spots during this track, although I do enjoy the music itself. I didn't notice this during any other track, and David's voice really is a big asset to the other songs. The sound quality actually comes out better than I had expected from a non "big label" release. The cymbals do sound a bit tinny in spots, and the vocals might be a bit louder in the mix (but crystal clear nonetheless) than optimal, but the energy and impact of the music is felt full force. The crunch of the guitars is loud and clear, and drums sound very tight and crisp. With some effort in promotion of his material and dedication to playing in front of eager hard rock fans on a consistent basis, I see no reason for David Shaw's music not to attract a lot of fans. I really like how Steve Cone and Al Esis play out their roles on this album. It sounds more like a band effort, complete with the chemistry from start to finish than a solo album. If these guys do continue to play together and record new music together, I think they'll naturally develop into an excellent band.